I never expected to feel love for my daughter in such a physical way. You know how your heart jumps in your chest when your new boyfriend calls you, or when your husband comes home with a single red rose or a huge bunch of lilies, or when your best friend announces that she is pregnant? Well, holding your daughter in your arms and getting that hug back from her feels just the same – it’s the feeling of love. Physical love. It also happens when she caresses your face, or your arm, or your hand as she suckles your breast or as you give her her bottle. Then there is also the times when all you want is kiss – no, eat! – her tummy, her legs, her feet, her cheeks, her nose, her neck. That also comes from a place of physical love. You just can’t resist it. Just like when you want to kiss your new boyfriend all day long, and then again all night long, or just like when you want to kiss that precious space in your husband’s neck. But what always takes me by surprise is the warmth of her hand in mine. Not when we’re about to cross the road. No – in a quiet moment. When we’re looking at a book together, or when she is upset or ill and I am about to take her in my arms to give her the biggest cuddle to make her feel better. That tiny hand provides so much warmth, I can never quite believe it when I feel it. 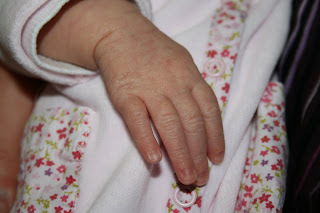 PS: The picture is from when my daughter was 2 weeks old!